While birds are not the main reason most visitors to the great continent of Africa make a grab for their cameras, there are some specimens that are well worth the time and patience to view. Birdwatchers will find an African safari to be a veritable paradise with many impressive and beautiful birds to add to your observations. 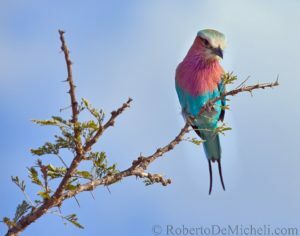 Following are some of the most spectacular bird you will find in the regions of Southern Africa and the Okavango River. One thing for sure, Africa makes them big. 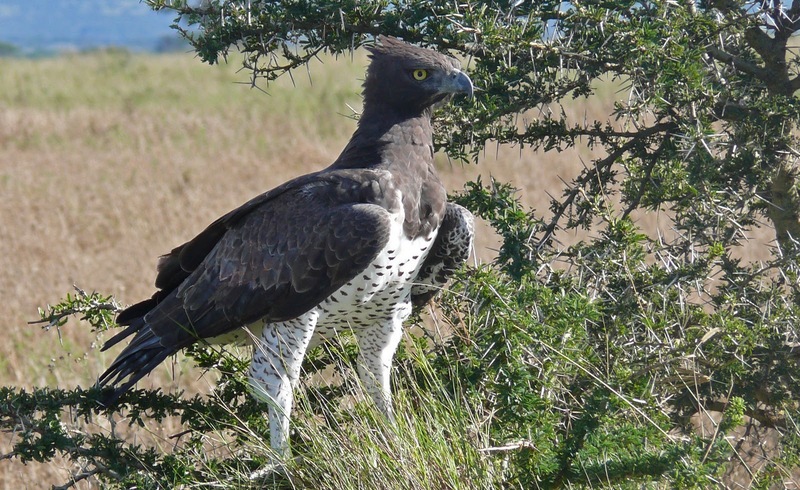 The Martial Eagle is a ponderous airborne predator capable of swooping down and carrying off young antelope, monkeys, pigs and all types of lizards and desert rodents. 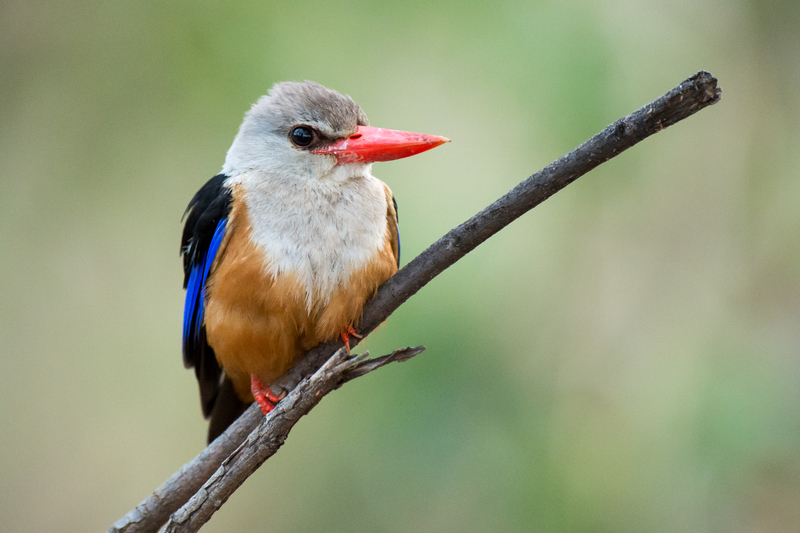 The nest of the Martial Bird is high in the Marula tree where it litters its lair with the bodies of its prey. You can find evidence of their presence by strewn skeletal remains of monkeys, lizards and other local wildlife at the base of these trees. This bird is not one that can be missed as its imposing size can be seen at great distances in the trees or circling the skies. 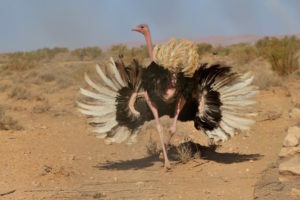 An Ostrich is certainly one of the most commonly observed birds on the African Plains. At over 2-meters in height and a top-speed of 70MPH, the ostrich is by far the most impressive bird you will ever see and never forget. Armed with a fearsome kick and admirable parenting skills the connection between these birds and human observes is always one of respect and awe. There is little doubt you will identify these unmistakable birds from even a great distance. Across the waterways of southern and Western Africa there lurks a hunter with deadly efficiency and techniques that put modern fighter pilots to shame. 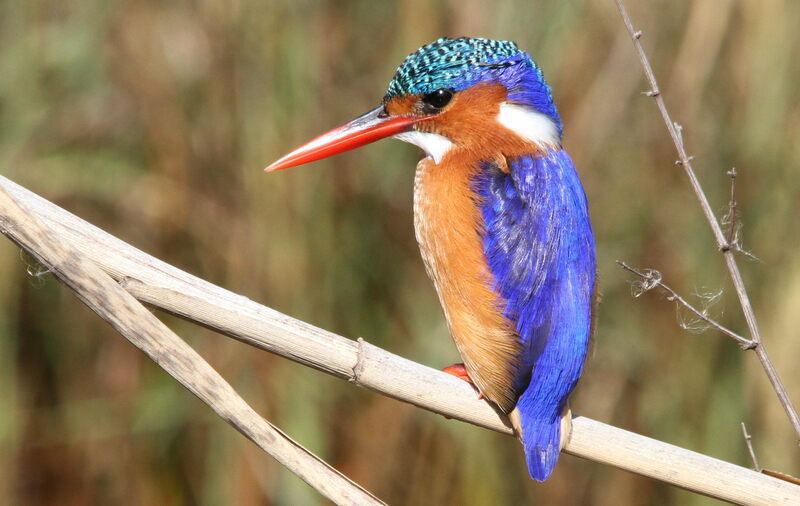 The Malachite Kingfisher is stunning Azure blue and if it weren’t for its bright markings, it would be impossible to detect the Kingfisher with its hypersonic speeds and minuscule dimensions. If you are lucky enough to glimpse this bird it will probably be near the banks of a river filled with fish. Not many people know this, but the Lilac-Breasted Roller is the show stopper of the African safari and probably the most photographed bird of its kind. It features a full seven shades of blue as well as greens, pinks and purples. Furthermore, they offer an amazing spectacle as they swoop through the air to catch flying insects. Their mating rituals include a lot of bobbing and swaying and it is a site sure to capture the mind and attention of all. Furthermore, they are a common sight on most African safaris. The fish eagle is found in all areas of Africa where there is a water supply rich in their favorite food. 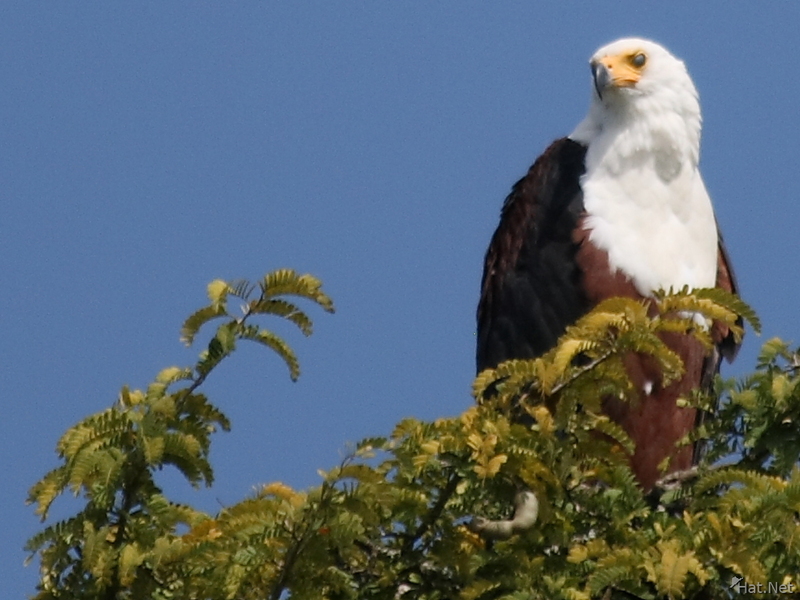 Like many eagles, the Fish Eagle mates for life and pairs will be found soaring high over the lakes and rivers in a stunning skyward dance. They feed almost entirely on fish and are capable hunters. But, they can also be found swooping in and taking the fish caught by herons and other waterfowl. Human invention and architectural innovation pales in the craftsmanship and ingenuity of this tiny bird. 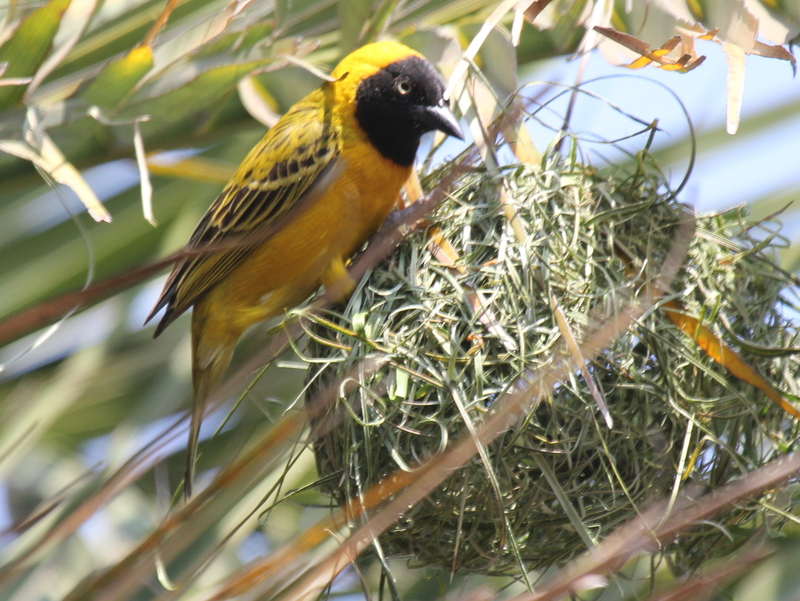 There are actually two types of Lesser Weavers in the African scene and some build giant communes where hundreds of birds can exist happily for hundreds of generations. But, the type that builds its own free-swinging next is the favorite. It is unfathomable to think that this tiny builder equipped with nothing more than a beak can weave and construct a full sized home where he and his family will be safe and happy – and this is accomplished all in one day. if you are looking to go on a guide bird watching course while in Africa try Ecotraining. They offer a number of wildlife school including field guiding, wildlife photography and bird watching.